For most of us, this is where it all starts. The toy cars, the ones you “casually” buy as you’re shopping for your groceries and other household goods. These innocent-looking things greet you as you walk by the toy section of your local retailer. “They’re only a dollar!” they said. “What’s a dollar here and there?” they said. And before you know it, you’re inundated with these damn things. These days, I keep the little ones safely tucked away, neatly stored and sorted in thread organizers, because there’s simply no way to display all two-thousand-plus of them without cluttering up the house. But once every year when I do these lists, I get to break them out and really appreciate the gems that the diecast gods have brought us. These are my selections for the best 1:64 models of 2018. Truth be told, the best TLV release from the past year was actually a diorama and not a car. Nonetheless, the FD-generation RX-7 is one we’ve been asking for for a long time, and Tomytec delivered by giving it to us in no less than five different colors. I’m going with the yellow one here, as no color is better suited to represent the legends from the 90’s. From the latest 5-pack comes this purple UTE, a casting that hails from the later end of Matchbox’s golden days. Because of its obscurity, I never bothered collecting these back in the day, and now I realize what I’ve been missing out on. One gripe I have with the Premium line is that they never get the wheels right; they’re always either too big, too flat, or too cambered. Not with the 2000GT. They did it justice, got the proportions right, and rolled out a nice upgrade over the old Tomica Limited release. My favorite series from 2018 was M2’s Coca-Cola line. Though absurdly overpriced, their overall execution of the theme and use of colors were flawless. Any of the other models from the set could’ve served as a worthy substitute, but this festive, red-and-green Daytona was the clear standout. Mopar or no car. The return of the Dragstrip Demons theme was a huge shot of nostalgia for those who were in the Hot Wheels game a decade ago. With its bold, patriotic colors, the “Psychlone” is my favorite of the five. Here’s to hoping that they bring back the Funny cars with the opening body shells, as this series certainly deserves an encore. Straight from the pegs to the year-end list, my latest find is also one of the best. Despite the cartoonish proportions, this Shelby casting has never looked better than it does here, dressed in blue, with white accents for contrast. The best from the blue brand. Imagine all the people…buying Liberty Walk GT-R’s. 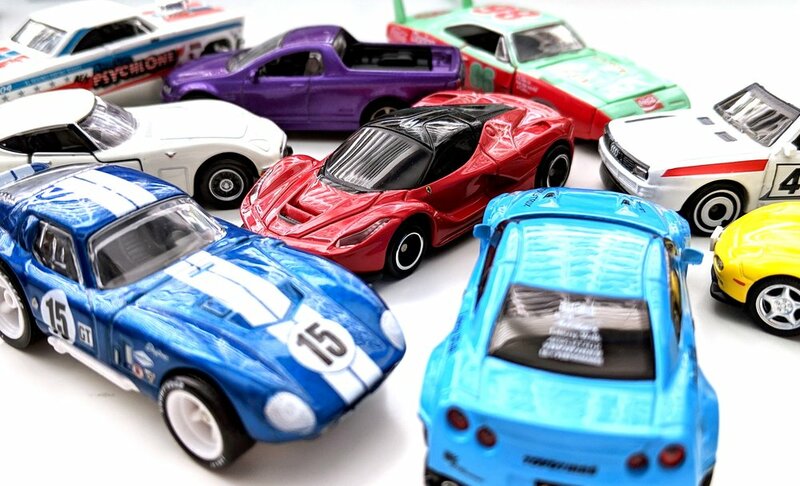 The biggest diecast news (and surprise) in 2018 was TSM (known for their 1:43 and 1:18 racecars) taking the world by storm when they announced their foray into the small scale market. Instant success. Collectors have been eating up the LB Works GT-R and, after getting one for myself, I can see why. The details. The sharp decals. The perfectly sculpted wheels. Every year when I round up the best models, it seems like a Tomica always ends up on top. No brand is more versatile. They can do a quality children’s toy as well as they can do a highly-detailed adult collectible, all while maintaining the same accuracy on the former that you would expect on the latter. With all of its swooping lines, the LaF is not an easy car to capture perfectly - just ask Hot Wheels - but it’s like they did the Ant-Man shrink on the real thing. The headlight inserts even have the LED strips as shown on the real car. All this on a model that’s geared for kids first and foremost. Congrats once again. Model of the year.